In this 24 Hours to Hell and Back episode, Chef Gordon Ramsay visits Patrick Molloy's in Hermosa Beach, California. Patrick Molloy's was opened by Alice, her current husband Fred and her ex husband and upon his death it passed to their son Patrick Molloy Bastian. The unconventional partnership and tension in the restaurant has continued between Fred and Patrick. The staff play off the tension and aren't sure who to follow and Alice feels like she is in the middle. They lost $135,000 in the last year and can only stay open for a few more months. Gordon arrives in disguise with some local surfers who have ordered from the menu. The chicken wings are dry, the taco is a mess with frozen fish, the shepherds pie is bland and the gravy is gross and the pizza is soggy. Gordon removes his disguise and meets with the staff. He closes the restaurant and they go outside to the Hell on Wheels truck. He shows them restaurant hidden footage including inappropriate behaviour, arguments, a filthy, mouldy kitchen, cross contamination and improperly stored produce. The staff meet and Patrick admits that he has given up. Gordon reads the customer reviews and they are brutal. He inspects the kitchen and Gaby tells them that they don't do deep cleaning. There are no dates on the food, there is a huge tray of pre-cooked chicken, gravy and rotten produce. The kitchen staff deep clean the kitchen while he meets with Gaby, who tells him that Fred controls the decisions in the kitchen. Gordon meets with the owners to reveal the problems between them and he sends Alice home to rest. 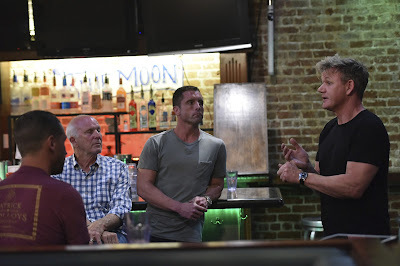 Gordon introduces the new menu to the kitchen staff and they love the new food and he gives Patrick a pep talk to get him to step up and to fix the relationship with Fred. He also speaks to Fred and encourages him to take a step back and to trust Patrick. Gaby shows off his new kitchen to Fred and Patrick and tells them he is the boss. Gordon kicks out everyone except Fred and Patrick and stops the clock. They continue to squabble and they don't seem to be getting anywhere with the relationship until they all sit down as a family. For relaunch night, the customers love the new decor but there are some issues in the kitchen as Gaby is too quiet in the kitchen. He has a pep talk from Patrick and communication greatly improves. The customers love the new food and the relationships look on track to improve. Patrick Molloy's is open. After the show, they had to make changes to the decor after the retrospective planning permission for the redesign was rejected for the ridiculous reason that it made the restaurant more like a bar. Three months later, Fred and Alice are on vacation in Costa Rica and Gaby is now a managing partner and Head Chef. Reviews after the show are very mixed, there are positive comments on the new decor and food but multiple negative comments about poor service and issues with the bar staff. Planning a visit to the restaurant? Check out their website for more info including opening hours. Patrick Molloy's was aired on August 8 2018, the episode was filmed in November 2017 and is 24 Hours to Hell & Back season 1 episode 7.